Two cards made with the fun sticky labels and new stamp set my daughter got for me. Two windows using recycled images from a Thomas Kinkade calendar and the conservatory window die (Sizzix). I kept them simple to showcase the scenes in the windows. Here's a fun little swinging teddy card I made using the Favorite Teddy Bear Stamp Set (Stampin' Up). Sharing a simple sympathy card I made last week. I stamped and embossed the white swirls before adding ink to the left side of the card. The flower and leaves are stamped and embossed on vellum and lightly colored with ink pads on the reverse side. Here's a quilt card I made for a friend going through a very hard time right now. Here's another version of that same "quilt pattern" in different colors and different matting. Here's a simple birthday card I made for a friend who isn't the frilly type. I thought it fit her style and personality well -- right down to the sentiment. 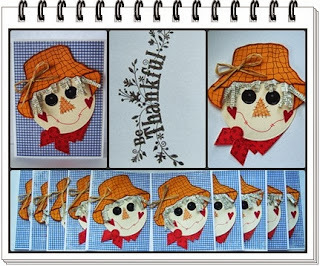 Here's a simple fall card I made by recycling a Mary Engelbreit calendar image. It's simply cut out with the Spellbinders top note die and layered several times. I don't think the picture shows it up very well, but I also added orange glitter to a few of the leaves to make them "pop." I have wanted something nice to color images with for some time. Something with several shades in each color, but also something that didn't cost a fortune! I really liked the Prismacolor pencils, but the price was a bit more than I wanted to pay! d) cost a WHOLE lot less!!! I decided to try the Prismacolor Scholar Pencils - and as you can see the colors turn out very vivid! BTW- I use baby oil and Q-tips to blend them -- I like to save money on supplies whenever possible! Here's a girly birthday card I made using the Favorite Teddy Bear stamp set from Stampin' Up. It's been one of my favorite sets since winning it on ebay! Here's a simple fall card I made using different colors than the usual fall colors. I used a leaf template that I found on-line and traced it on my paper. Here's a simple little paper pieced tree card I made in an autumn theme. The pattern for the tree originally came from Paper Crafts Magazine -- not sure if they still have it on-line or not. I had a lot of fun making this autumn card with colors other than the usual fall colors. For this one I used a friend's flower stamp, stamped it on different papers, cut out the the layers, and popped them up with dimensionals.